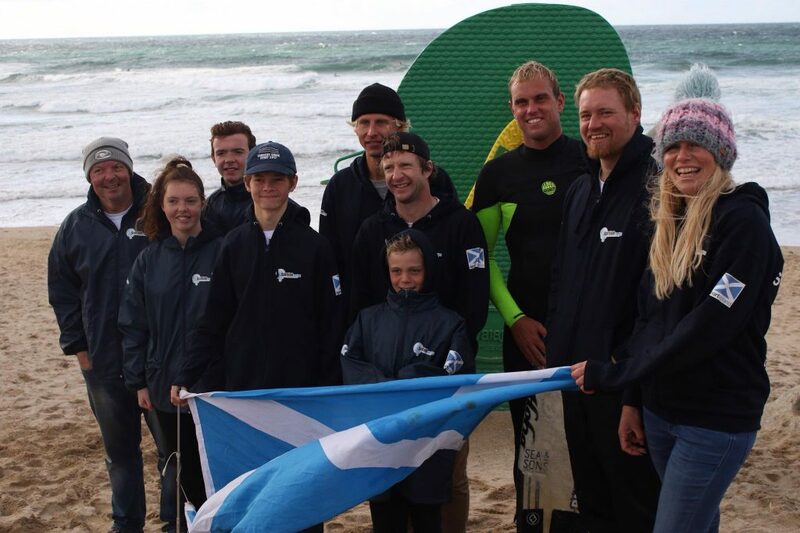 Team Scotland made the long journey to Newquay last weekend for the British Surfing Championships & British Cup hosted by Surfing England. The 10 strong team was made up of the following surfers in the Open Men’s Division: Mark Boyd (NSSC), Mark Cameron (BSC), Donald Peace (LSC), Mark McKay (GCSC). 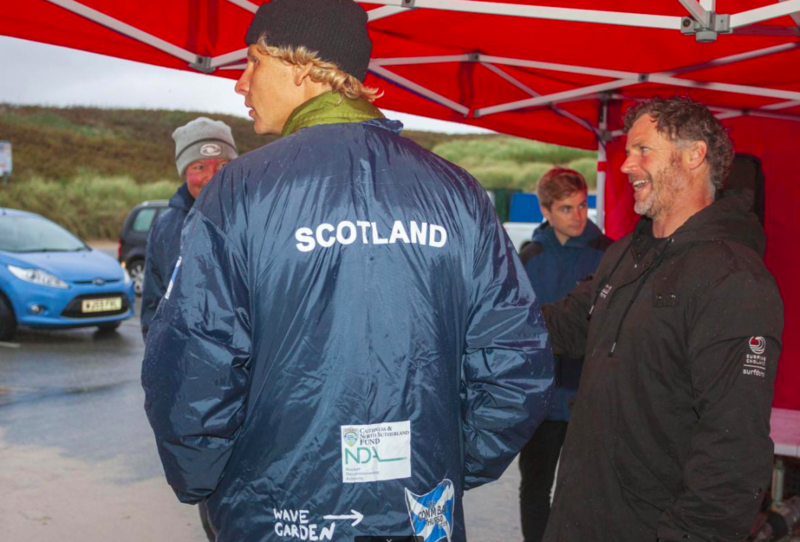 Mark Cameron posted the highest single wave score of any Scot with a 4.5 in the first round of the mens open division and Mark Boyd posted the highest heat total of any of the Scots (7.73) to become the only Scot to progress into the semi finals at the event. Boyd would come up against eventual Silver and Gold medal winners Luke Dillon (ENG) and Jay Quinn (WAL) in the semis and was unable to progress. 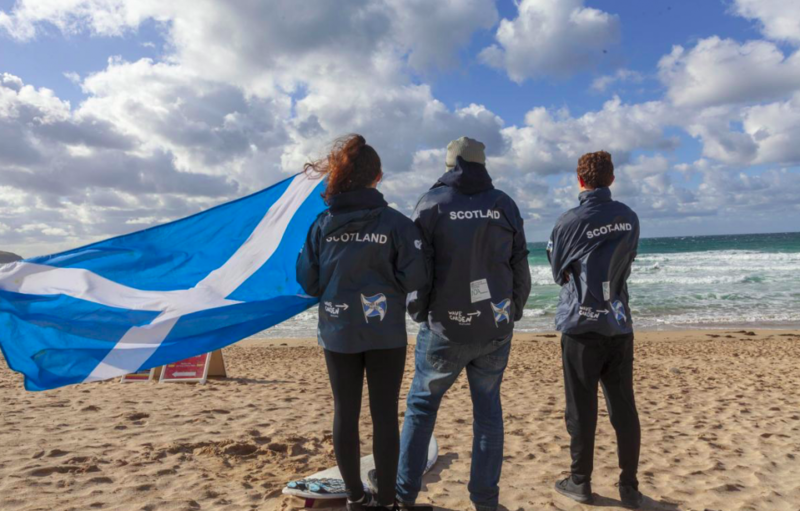 Ingrid Morrisson and Tamzin McQueenie (EBSC) represented Scotland in the Open Womens division and in the U18 Boys; Hayden Peace (LSC), Owen McQueenie (EBSC) and 10yr old Ben Kobedza (MFSR) would fly the flag. Britain’s best surfers have just gathered at a blustery Fistral Beach in Newquay, Cornwall this weekend to compete at the 2018 British Surfing Championships & British Cup of Surfing. 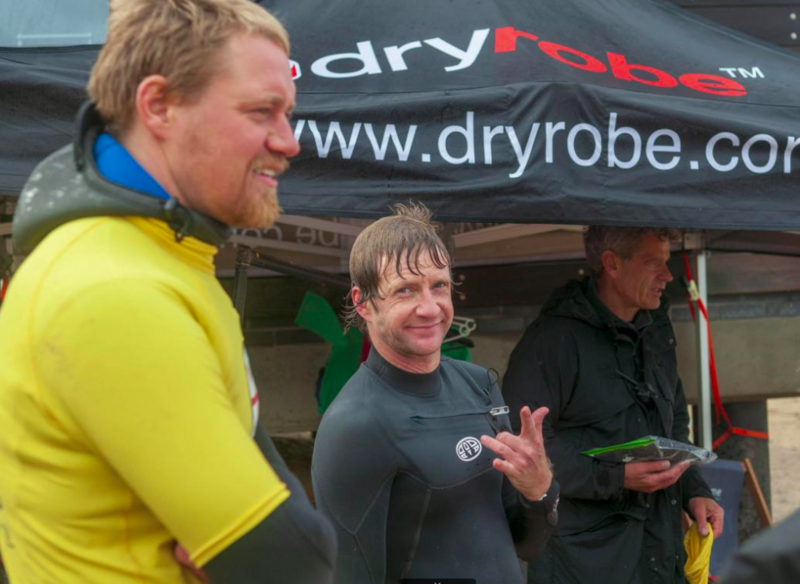 Elite surfers from England, Wales, Scotland and the Channel Islands took to the waves for a day of intense competition, all in the search of individual and team national surfing titles. The road to being a part of the historic event has been a long one for some surfers, with qualification being made at respective home nation championships earlier on in the year, giving time for the surfers to focus and prepare. A new format for the event was established with England hosting the event in 2018, as it now begins an annual rotation between the home nations. 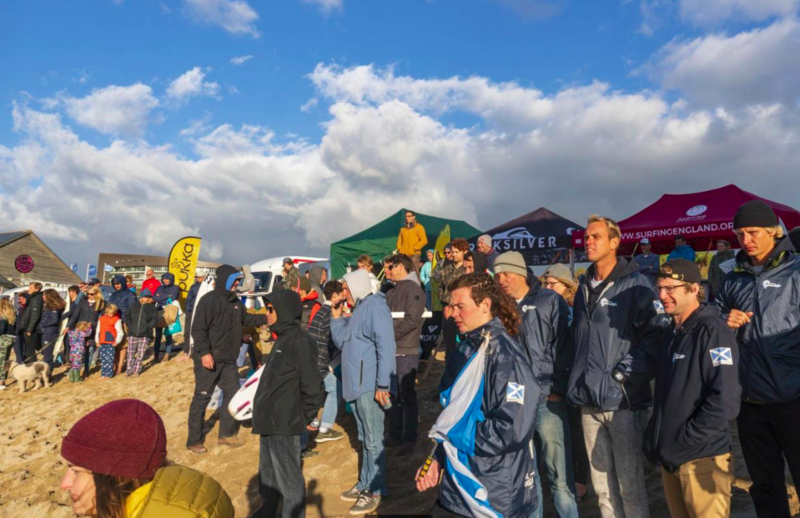 Contest organisers at Surfing England knew they had a small window of opportunity to run the event and competition was fierce from the word go, with 20 minute heats running back to back from 8:30am to 5pm as surfers progressed from quarter finals and aimed for the coveted podium positions. 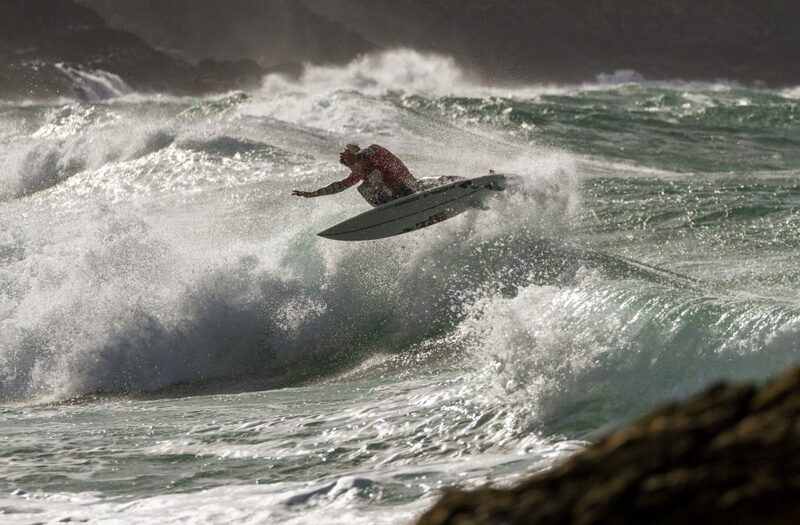 Mirroring the format of the World Championships the surfers also earned team points for their home nation as the event saw the return of the British Cup of Surfing trophy. There was impressive surfing from all, including some of the surfers who had just returned from representing Great Britain at the World Championships in Japan. With a growing swell and rising tide it, the scores continued to drop live to the surfers and the beach and even across the web thanks to an innovative new live scoring system. Surfers would emerge from the water knowing whether their dreams of winning were alive or if it was the end of the road. The stage was set for some electrifying finals, the tide was high and the waves were powerful as Britain’s best showed what they were made of. Reubyn Ash put on an aerial display of the highest calibre and won the Go Pro move of the event. 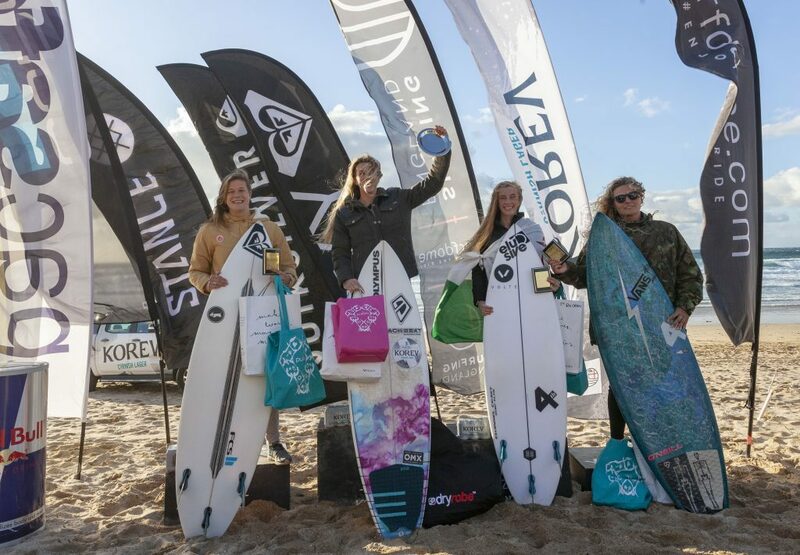 First of the finals saw Channel Island’s Kitty Brewer win the Roxy Under 18 Girls title, swiftly followed by England’s Seth Morris winning the Quiksilver Under 18 Boys. 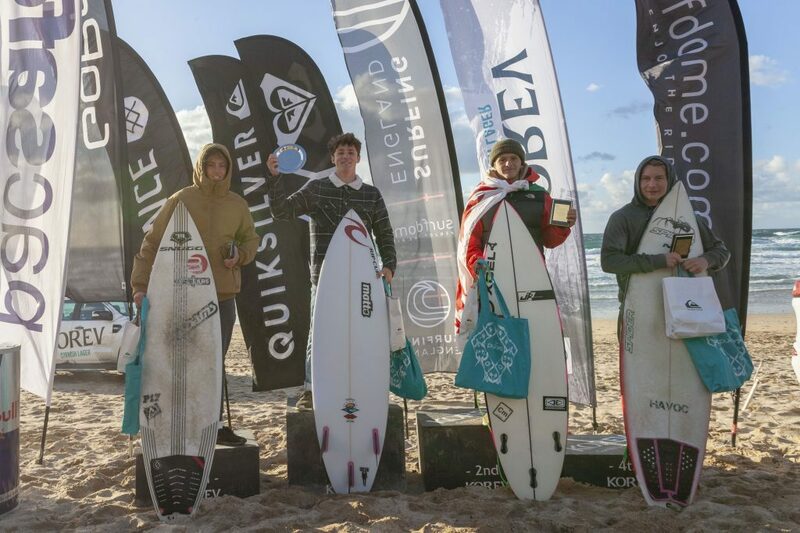 Next up was the Roxy Women’s division in which England’s Lucy Campbell was victorious, then the Quiksilver Men’s final to finish the event saw Wales’ Jay Quinn become British champion. 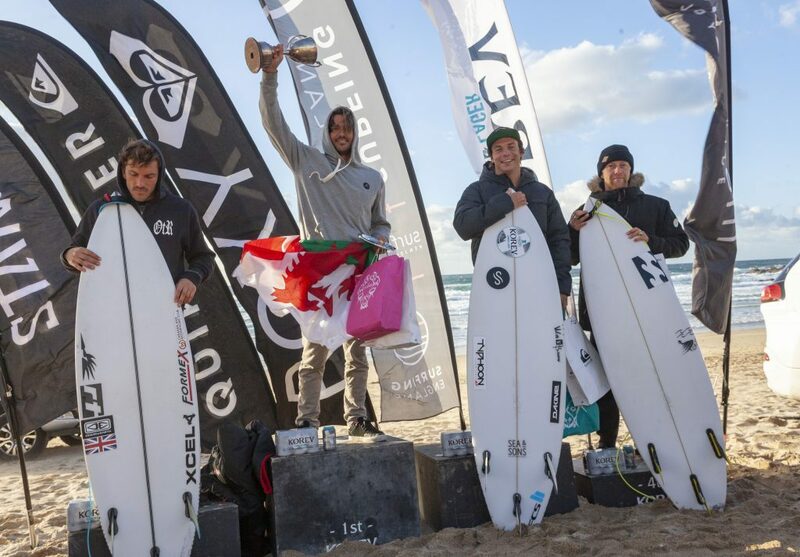 In the British Cup of Surfing, Team England were victorious on home soil with Wales finishing second, Channel Islands in third and Scotland in fourth. 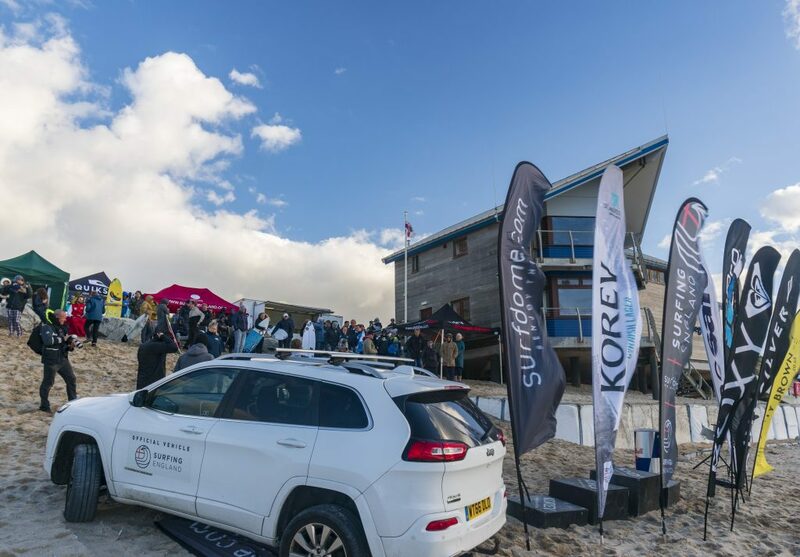 Surfing England wish to extend a huge thank you to the sponsors of the event, with Korev Lager as headline partner and major supporter, as well as The Caravan and Motorhome Club as supporting sponsor. 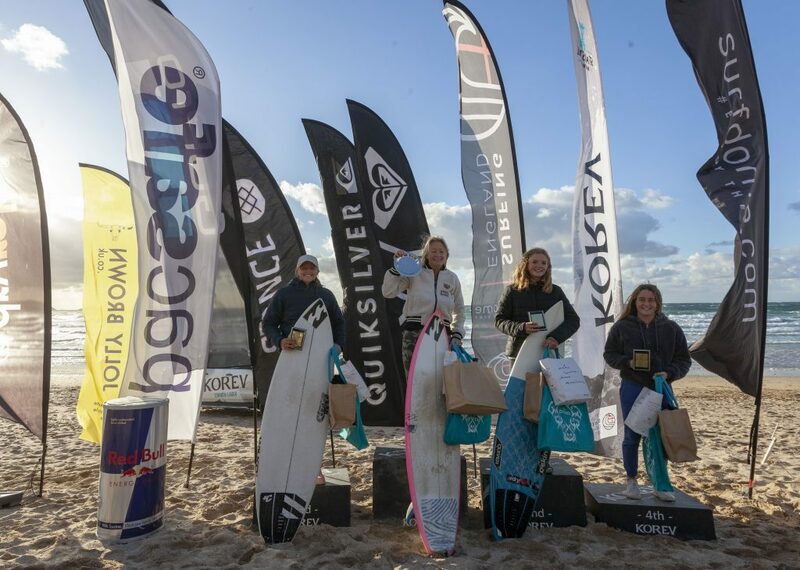 All event partners: Korev Lager – Caravan and Motorhome Club – Quiksilver – Roxy – The Wave – Surfdome – Jeep – Stance – Hippeas – Pukka Herbs – Go Pro – Jolly Brown – Dryrobe – Pacsafe – O’neill. 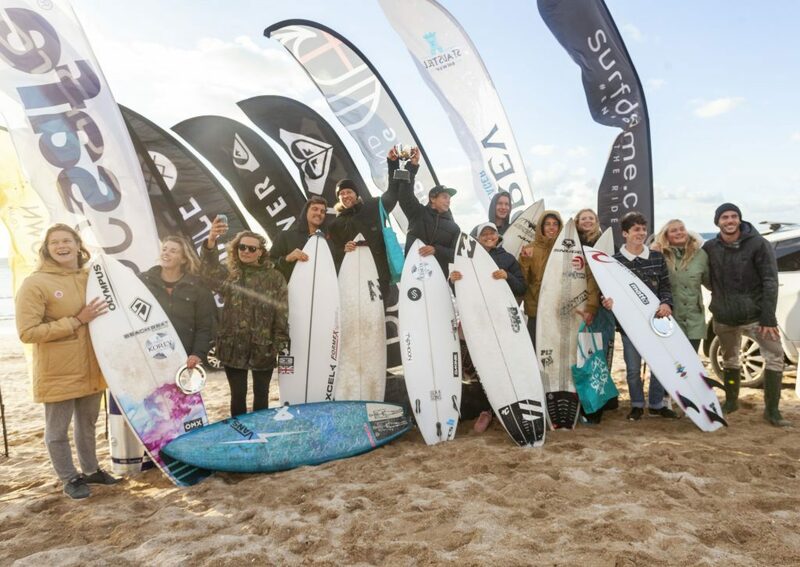 A big thanks also to our fellow home nation surfing bodies who’ve come together to secure the events future, the Channel Island’s will host the 2019 British Surfing Championship and British Cup of Surfing.